With my Mom's help I have gotten the quilt top done. My mom did the top left block the beet. She also helped get the blocks together and sewed the green leaves on. She also gave me more of the purple and black fabric for the boarder out of her stash. 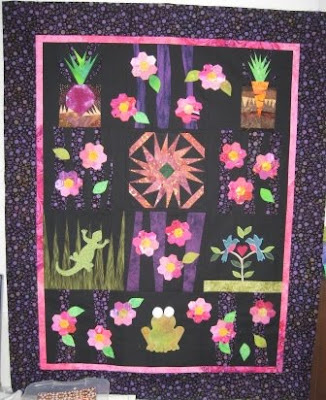 I have not quilted this quilt yet as I have not found a backing that I like. I think I want a flannel but I would like black and pink. Or maybe Black and white. It will have to wait to get quilted. I have one block it use on the back as a label. I have been trying to make some lap quilts to use in the living room for TV watching.